I’ve worked for myself for almost three years now and a lot of my friends have as well. Adam and I started The Wonder Jam back in 2013 and pretty consistently have had interns every spring, summer and fall. They have never been virtual, always in-person. Just recently we brought on an admin assistant/studio manager/project manager hybrid! When you’re bringing on an intern (disclaimer: we pay our interns a monthly stipend of $200) or anyone in a part-time/assistant capacity, be really clear about what you want them to do. We believe that interns should LEARN and do cool stuff. Not just get coffee. We think that they should gain experience by creating work (designing, photographing + writing) based on real client needs. 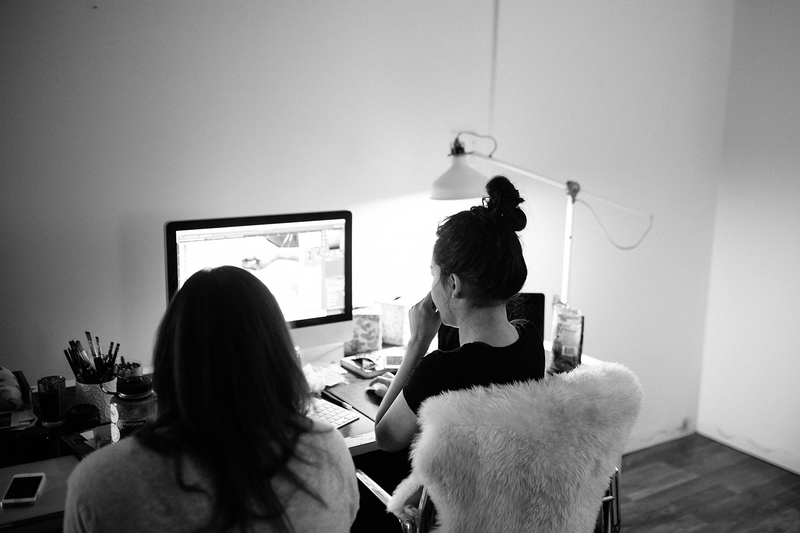 Our clients don’t always see the work they’re creating, but our interns are able to create work with substance. We try to keep our team out of their inbox. We check our email about 3 times a day and can’t depend on emails to communicate small needs or tasks. We also respect our interns/contractors time and don’t feel like it’s appropriate to text them if we need something. It’s okay to shut off everything when you’re off work. Texting takes it too far and can cause anxiety or stress for everyone. Basecamp: We use Basecamp to keep our projects in order. We take info we receive via email and organize it by project. Tasks, documents, notes and logins are all stored here. Slack: We use Slack for conversation! It’s an internal chat system (actually, it can be opened up to clients or a community) and we use it to ask for things we need or walk through a project. It’s great because you can talk to one single person as a direct message or create groups of people. We have quick turnarounds with our clients and so I make it clear that we aim for faster deadlines. Meeting deadlines is really important in whatever industry you work. Instead of assigning projects or tasks and leaving them alone, I try to say things like “We’ll review this at 2pm” or “Let’s aim to have this done by next Monday.” An intern doesn’t have the ability to see the big picture and know how quickly things move in your business. Whether it’s about a project with your client or how their time has been, it’s important to give them a voice. Preparing them for future jobs or running their own business is a big responsibility. You rarely do well in any position if you don’t have practice speaking in front of others or sharing what you think! Any advice for those of us who have interns? Did you have an amazing internship? Why? As a co-op student I intern every other semester, alternating semesters in the class room and semesters working as a full-time designer within a company, and have a lot of advice from an interns point of view. I think that one of the most important things when having an intern is treating them with respect. The more respect you give your intern the more respect they’ll have for you and your company and the work will show it. There have been many times as an intern when I have felt disrespected and have been treated with a condescending tone. If you’re treated badly you stop caring about the work. Something that I’ve found very useful during internships has been presenting my past work to the office when I first start. That way everyone is aware of my skill level and I feel like people know more about me, in turn making me feel more comfortable in the office space. I love that you say things like “We’ll review this at 2pm”. Not just as an intern, but as someone new to a company it’s often difficult to gauge how much time you should spend on each project. That type of clarity is SO nice when you’re first starting a job. I love this!! Respect is so key. And I hate that you’ve felt disrespected. That is just so stupid. Totally stealing that idea of presenting work at the beginning of the internship. SO genius. I agree with Lauren. Treating your interns with respect is very important. But also helping them and asking them for feedback (as you suggested, Allie) is crucial. I have been an intern at a newspaper in Germany and it was a great experience. They trusted me to write an article (on my own) on my second day. After writing it, a colleague sat down with me and gave me some tips on how to improve it. After that I got to write articles and take pictures all on my own. And they got published – it was an amazing feeling! Here and there my boss told me how to change a few things in my articles and how I to improve my photos. They also included me in the daily meetings and I got to pitch my stories. It felt like I was part of the team and I couldn’t have asked for a better start in my career. As an intern, I think it’s equally important to show your internship organization that you are interested and willing to learn and improve. It’s such a great opportunity, you shouldn’t waste it. That is SO awesome that you got to write an article right away. We really try to allow our interns to do real work. Our struggle has been that our fall/spring interns are just so dang busy with classes, studying and outside activities. It seems like there is so much to do for students! !